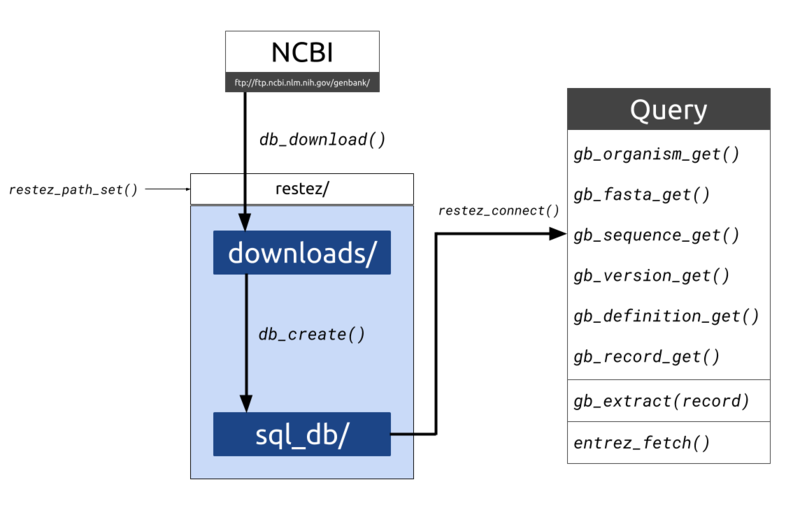 Download parts of NCBI’s GenBank to a local folder and create a simple SQL-like database. Use ‘get’ tools to query the database by accession IDs. rentrez wrappers are available, so that if sequences are not available locally they can be searched for online through Entrez. See the detailed tutorials for more information. Vous entrez, vous rentrez et, maintenant, vous …. restez! Downloading sequences and sequence information from GenBank and related NCBI taxonomic databases is often performed via the NCBI API, Entrez. Entrez, however, has a limit on the number of requests and downloading large amounts of sequence data in this way can be inefficient. For programmatic situations where multiple Entrez calls are made, downloading may take days, weeks or even months. This package aims to make sequence retrieval more efficient by allowing a user to download large sections of the GenBank database to their local machine and query this local database either through package specific functions or Entrez wrappers. This process is more efficient as GenBank downloads are made via NCBI’s FTP using compressed sequence files. With a good internet connection and a middle-of-the-road computer, a database comprising 20 GB of sequence information can be generated in less than 10 minutes. For more detailed information on the package’s functions and detailed guides on downloading, constructing and querying a database, see the detailed tutorials. #> Warning in list_db_ids(): Number of ids returned was limited to . #> Set `n=NULL` to return all ids. #>  "Unidentified clone B18 DNA sequence from ocean beach sand"
#> DEFINITION  Unidentified clone B18 DNA sequence from ocean beach sand. #>  id(s) are unavailable locally, searching online. Want to contribute? Check the contributing page.